← Why Didn’t You Just Tell Them You Were a Moderate Man? 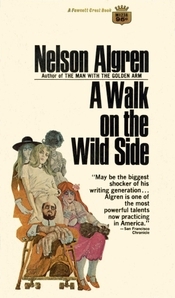 A Walk On the Wild Side was his last successful novel, in 1956. Lou Reed scorned this book in his classic monologue, and it has nothing to do with New York City, mostly being set in New Orleans. But the pimps and hustlers, the legless barroom fighter Schmidt on his wheeled platform, the homemade O Daddy condoms, the Navy commander wanting to be “made to behave” by the Black matron of a whorehouse – all of them would have fit perfectly into a Lou Reed song. Never play cards with a man called Doc. Never eat a place called Mom’s. Never sleep with a woman whose troubles are worse than your own. Never let nobody talk you into shaking another man’s jolt. And never you cop another man’s plea. I’ve tried them all and I know. They don’t work. Life is hard by the yard, son. But you don’t have to do it by the yard. By the inch it’s a cinch. And money can’t buy everything. For example: poverty. I had never heard the term “shaking another man’s jolt” before, but from the way it’s used in the rest of the book, it means interfering with how another prisoner is serving his time. The old man later dies in the same cell, shot while trying to escape a 99-year sentence. In the cheery old summer of ’31 New Orleans offered almost unlimited opportunities to ambitious young men of neat appearance willing to begin at the bottom and work their way up the Ladder of Success rung by rung. Those with better sense began at the top and worked their way down, that route being faster…. Self-reliance for the penniless in government aid to those already had more than they could use was the plan. But park benches were wet of a morning whether it rained or no; and it was possible to tire even of bananas. Still at all, times weren’t as hard as some people grew fond of pretending. All that it happened really was a withdrawal from abnormal prosperity with business progressing on a downward grade toward new planes of normality and increasing equalization of opportunity. In short, we were going full steam ahead. Only this time one exciting opportunity was precisely as good as the next exciting opportunity. Which was to say, simply, that no one got paid any more. In one of the novel’s most gruesome scenes, Dove walks into a restaurant, shortly after arriving in New Orleans. In the back of the restaurant, a man is beheading turtles for soup. Now the trouble with turtles is that they believe all things come to him that will but struggle. There’s always room at the top for one more, they think. And in this strange faith the snapping kind is of all the most devout. For it’s precisely that that makes them the snapping kind. Though the way be steep and bloody, that doesn’t matter so long as you reach the top of the bleeding heap. The pile of turtle bodies grows as the butcher throws the heads on the floor, and the bodies keep fighting even after their heads are severed. Algren continues at length with his bloody noir predecessor to Yertle the Turtle. Losing his head didn’t lose one his footing. His legs kept seeking yet bloodier heights. … Sensing that time was against him, he worked all the harder to succeed. Until the floor about the pyramid streamed black with blood, with some on their backs and some of their bellies. Stepping on the stumps of a hundred bleeding necks, hauling itself over other backs, giving one a kick there and one a shove there, the body sent a dozen rising climbers sprawling over the cliff to failure. … Driven by some strength greater than that of others, waiting contentedly over mothers and orphans, it got its blind flippers at last onto the tail of a red snapper, hold itself onto the snapper’s back, pushed Red out from under, and landed smack in the middle of the heap. He was the King of the Turtles. The king waved his arrogant flippers triumphantly – “Always room for one more at the top” – just as something bumped him hard from behind and his short day was done. Sliding, sprawling, skidding, he slipped off the heap in a bloody skein and landed flat on his back below the table wigwagging frantically. And as he lies there, Algren imagines the dying turtle’s pleas for help from his comrades. “I never knowingly harmed a fellow creature unless he got in my way. I never took unfair advantage unless it profited me. … A devoted father, loyal citizen, a faithful employee, a kind employer, a considerate neighbor, regular churchgoer. Out of purity of heart I respected the laws of God and man. Purity, and fear of jail. Could you really stand by and watch associate the internal die? Dove, of course, learns nothing. “What’ll it be, boy?” the waiter asked. He didn’t yet know there was also room for one more the bottom. He grew up in working-class Chicago and spent his entire life fighting injustice (as well as drinking heavily, suffering from depression and breakdowns, and gambling). Like most “radicals” he was involved with the Communist Party in the 1930s but grew turned off by its racism and its ideological rigidity. He wrote blistering books about Chicago corruption, and his last book (published posthumously) was about the Rubin Carter murder trial. His only lasting romantic relationship was with Simone de Beauvoir. He was elected to the American Academy of Arts and Letters shortly before he died in 1981. The Chicago Tribune awards a Nelson Algren Award every year for short fiction, and the Nelson Algren Committee has an active Facebook page and holds a birthday party for him every year. This entry was posted in Books, History, Politics. Bookmark the permalink.